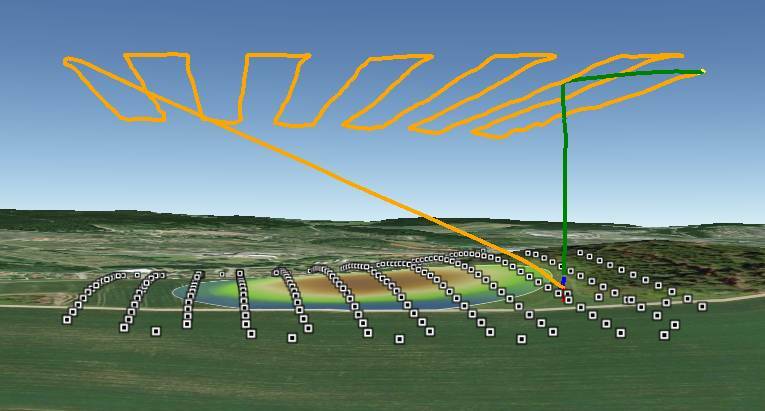 This page introduces how Copter/Plane along with the right equipment can be used to create 3d maps. The image above is Sylvain’s “the fallen blockhouse” and the winnerof the Feb 2014 T3 competition. A downward facing gimbal or hard mount to attach a camera to the vehicle. A good 3d rendering can be accomplished with 60 ~ 100 still pictures. There should be at least 65% overlap between consecutive pictures but aiming for 80% or even higher is recommended. The aerial photographs can also be combined with photos taken from the ground. The altitude of the mission depends upon the subject. For large flat areas, flying 40m ~ 80m above the surface should provide very detailed images (and thus a detailed final product) but for buildings flying higher (i.e. 100m above the building) reduces distortion. It is recommended to fly a mission that is made up of parallel tracks with each track between 25m and 100m apart. The higher the vehicle, the wider apart the tracks can be. In general you should aim for 65% overlap in pictures from adjacent tracks. The camera shutter needs to be triggered throughout the mission (i.e every 2 to 5 seconds or at regular distance intervals). Many cameras include a feature to take pictures at regular time intervals. Canon cameras loaded with CHDK can run a script that does this. Alternatively Copter/Plane/Rover can trigger a Canon CHDK camera at timed or distance based intervals. 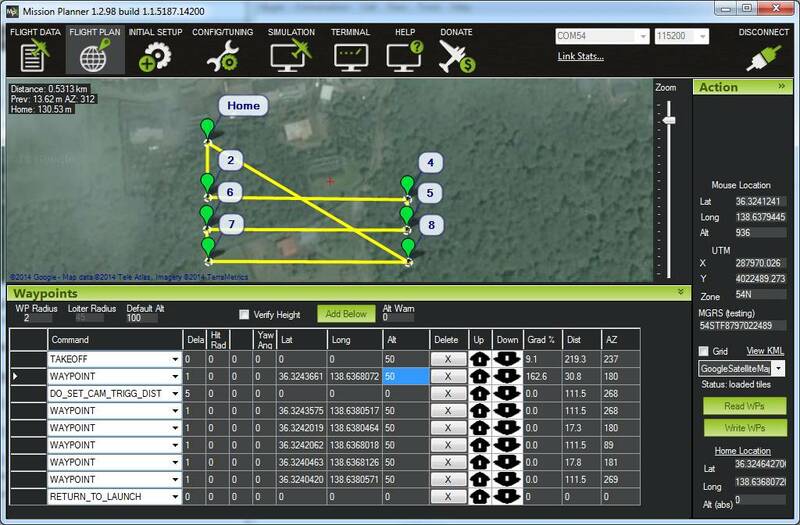 WAYPOINT - provide as many waypoints as required to fly over the scene in a grid pattern. Altitude should be entered in the “Alt” column. Adding “1” to the “Delay” columns will cause the copter to momentarily stop at each waypoint. DO_DIGICAM_CONTROL will cause the camera shutter to be pushed once immediately if the APM/Pixhawk have been connected using CHDK or a servo. This command takes no arguments and like other “do” commands it executes immediately after the preceding waypoint command begins. DO_TRIGG_DISTANCE is the same as do-digicam-control (above) except the camera shutter will trigger every X meters. Where X can be defined in the first column labelled “Dist (m)”. Note: in AC3.1.2 there is no mission command to stop the command from running so the shutter will be triggered continuously until the vehicle is switched out of AUTO mode. RETURN_TO_LAUNCH should be the last command in the mission so the vehicles returns home. DO_SET_ROI can be used to point the nose of the vehicle and gimbal at a specific point on the map. Note: in AC3.1.2, as the vehicle passes a waypoint it will point to the next waypoint, this means that in order to point at a single point throughout the mission, the do-set-roi command must appear over and over again after each waypoint. In AC3.2 this behaviour has been modified so that this is not necessary. MicMac based toolchain together with (ImageJ/Fiji, QGIS, SAGA GIS): open source and free! All of these software packages work in generally the same way in that they consume the still images you’ve taken from the vehicle (and you may also choose to add pictures taken by hand from the ground as well) and produce a 3d image (in what format?). This is accomplished by automatically matching up the images, it does not rely upon knowing the actual location from where the image was taken. Sketchfab allows you to upload your completed 3d models so that others can interactively view the model in their web browsers. Click on the image at the top of the blog post to see an example. Three.js allows you to provide 3D models on your own webpage. Blender can be used to create video files of virtual fly throughs of the 3d model which can then be posted to YouTube. Here is an example by Richard. Dronemapper allows uploading and managing raw images.